If you work with a marketing team – consider yourself fortunate. Trying to take care of every marketing task on your own can be overwhelming. It can also be rather limiting. After all, just how many topics or different angles on an already well-covered topic can one person come up with? When you have a team, though, you have an opportunity for greatness. Some people might disagree with me, though, citing the fact that teams can suffer from egos, misunderstandings, and hurt feelings. That’s definitely true. We’re all human and make mistakes and rub each other the wrong way. But at the end of the day, a marketing team that gets on the same page and works together can accomplish great things. In fact, Margaret Magnarelli, the Senior Director of Marketing at Monster.com, backs up that point. Her suggestion is to do all you can to ensure that your team is in proper alignment. Getting aligned actually starts with you. You need to be clear on what content marketing really means to you. Only then can you successfully express your thoughts and plans to your team and anyone else involved in the marketing and production of your product or service. When Margaret and I spoke recently, she explained what content marketing means to her. Getting clear on what content marketing is to her has helped Margaret to convey her goals to her team. This is a great way to ensure that everyone is on the same page, which is an important step toward team alignment. If you want to be successful in business, you need to make sure everyone on your team is working for the same goals. Some people think having a mission statement is enough to keep everyone on the same page. But really, it’s going to take consistent effort to make sure you’re always on the same page. Margaret provided four tips that can help marketing teams to do this. When Margaret first started working for Monster.com, she spent the first 90 days working very closely with her team. She spent a lot of one-on-one time with each team member so that they would understand how she worked, what she wanted to achieve, and what she expected from them. You might thing 90 days is pretty impressive, but Margaret actually wishes she’d spent even more time training her team. The more time you spend with them, the better understanding there will be all around. 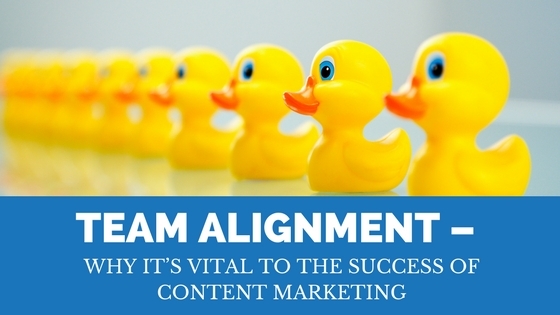 One of the best ways to stay in alignment is to have a content concept plan. Margaret came up with a strategy that works really well for her team. It’s called “how, now, wow.” She and her team create content based on these three pillars. How – This is “How To” content. It tends to be evergreen information and is meant to help readers overcome problems or achieve goals. You can use this content for blogs and newsletters. Now – This is not evergreen content. Rather, it is now – of the moment, fresh, and modern. These are stories related to what’s trending in the news and entertainment worlds. This content can be used for blogs and social media posts. Wow – These stories are shared mostly via social media. They tend to evoke an emotional response and are typically funny or touching. These three pillars form the framework that helps your team think about what you’re doing and whether you’re serving your audience well. Once everyone is on the same page, it’s vital that you learn to trust your team. Give them the creative freedom they need to thrive. Delegate projects to them without micromanaging them. Be open to suggestions and ideas, and let your team run with them to see if they work. Just make sure they stick to your basic guidelines. Regular creative meetings are a must. These meetings allow your team to bounce ideas off of each other to see what will work and what won’t. It gives everyone an opportunity to contribute, which is a great way to get different angles on stories/tips that have already been written about. Additionally, it’s important to communicate with other departments that are involved in the creative process. Power point presentations are a great way to let graphic designers and videographers know what you want and why you want it that way. Your number one goal as a business owner, marketer, or employee is the success of the company you’re working for. Every task you have, every product you make, every customer you serve – it’s all for the good of the company. And the only way you can be truly successful is if you work well with your team. As a business owner or marketer, you have a big job to do. Trying to do everything on your own is not the way to get it done. Make sure your team is well aligned. Learn to trust their vision, inspiration, and efforts just as much as you trust your own. When you do that, your team will enjoy the process and work even harder to ensure the success of your company. We’re recognized as a top content marketing & copywriting company on DesignRush! Check us and other great content marketing companies out here! If you’d like more tips from Margaret, make sure to follow her on Twitter. You’ll find her tweets completely inspiring. Margaret Magnarelli is the managing editor for content and senior director of marketing at Monster, the leading global platform for connecting jobs and people. At Monster, Margaret oversees a brand newsroom made up of seven content creators (all ex-journalists) who produce articles, social assets and videos aimed at job seekers. Her team took home the Content Marketing Institute’s 2016 award for Best Content Program and was a finalist for best infographic; she was a finalist for Content Marketer of the Year. Her team also was a finalist for Best In-House Content Studio from Digiday in 2016. She’s presented on content marketing at Content Marketing World and at an ANA Content Marketing Summit. Previously, Margaret served as executive editor at Money magazine and Money.com, and has been an editor at Good Housekeeping and Seventeen magazines as well. She’s written a book on tween idols, she’s expert in all things charcuterie, and she helped define the word snarky—no, seriously.